We hope you all had an amazing Christmas and New year and are fully refreshed for the term ahead. We will be looking at habitats and plants in Science this term. For our topic, we will be travelling through British History looking at the different ways of life, Kings and Queens and developments that occurred. As always, please continue to support your children at home with their reading, spellings and Mymaths home learning. Friday 11th January: Handwriting home learning tasks sent out. Monday 11th February: Safer internet day. Thursday 21st and Friday 22nd March: Base opening morning. Friday 5th April: Term ends. Spring term handwriting homelearning activities. Here we are at the end of another busy term. The children have done fantastically well with their learning and it was great to see so many of them achieve their 100% attendance certificate in assembly today. The children also enjoyed their Easter Egg hunt. Thank you to all the team at FORDS for arranging the eggs for us. We hope you all have a brilliant east holiday and come back refreshed and ready for summer term! Mr Paice and the Base team. We were very excited to take part in a nationwide science lesson this week. The BBC's Blue planet team hosted a live web lesson all about the oceans and how we can protect them. We looked at food webs and discussed ways we could improve our environments for the better. It was amazing to see live underwater pictures from the Blue Planet team. This week in maths we learnt how to read scale by making Play-dough. It was great fun weighing out the ingredients and watching it turn into different colours. We will use the Play-dough in school to help with our handwriting warm ups and fine motor control. If you would like to make it at home, have a look at the recipe below. Today we have been constructing 3D shapes from their nets. Mr Paice guided the class through each step. We did cutting, scoring, gluing and folding. Have a look at our shapes below. The children looked amazing in their world book day outfits today. We did lots of learning around their chosen characters and books including writing a book review and designing a book cover for their character. Check out the gallery below to the see the wonderful costumes. Today we learned how to plant seeds. We began by discussing what plants needed in order to grow. We then watched a clip explaining how to plants seeds and what happens during the growing process. Then we planted some reddish seeds together. Mr Paice told us they should only take 4 weeks to grow. We will need to take good care of the seeds and make sure they get enough water, light and heat to grow into yummy radishes. We will continue to observe the seeds and note the changes that occur in them. We have started a new unit of science for this term. The new unit is all about plants. The children created flap books that explain the different parts of a plant. If you notice a new plant growing in your garden or around you homes why not ask the children if they can remember the different names? Next week, as part of our awe and wonder session, we will be planting our own Radish seeds. The children will be able to take these home at the end of the term. Linda Paice (Mr Paice's mum) visited the class to talk about being Jewish. She bought in lots of artefacts for the children to explore. She spoke about the different festivals and even bought in some traditional food for them to try! 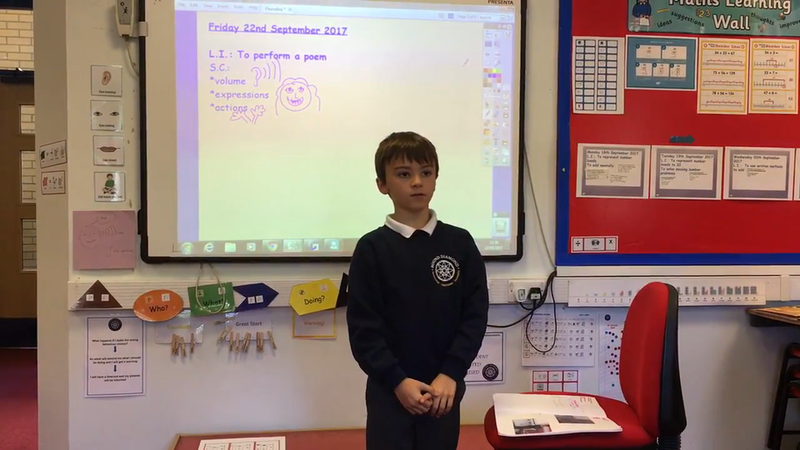 Computing learning: Isle of tune 18.01.2019 We used this website as part of our computing unit on music production. The children were really engaged and were keen to have a go at home. You should not need to download anything in order to use the site. This week we have based our English learning around the book Father Christmas by Raymond Briggs. We used to book to inspire our writing. This included character descriptions, and descriptions of some forgotten presents. This children linked their English to their DT learning by designing a new sleigh to help Father Christmas. We completed the week writing our own letters which explained what we wanted as well as why we should be on the good list! We look forward to our performances next week and we hope to see many of you there. Even in the run up to Christmas we still have lots of exciting learning planned so please ensure children are in school, on time, every day. The children have been taking part in a range of cross-curricular activities around the digestive system. the cross-curricular days started off with a whole school assembly from Dr Jane who spoke guided us through the different parts of the digestive system. We used this assembly to write a recount in our English learning. In DT we made different types of poo (one for a herbivore, one for a carnivore and one for an omnivore). We conducted a taste test in our science lesson, the Base children preferred the salty taste, some even liked the raw broccoli! We finished our learning with some PSHE where we made a poster to help stop the spread of germs as these can get into our digestive system and make us ill. The children came to School on Thursday to discover there had been a break in in the Base. Mr Paice's special clock had been stolen. The robber left behind some clues and a lot of mess! the children used the experience to write a newspaper report about the incident. Just a reminder we have our open afternoon tomorrow at 2:30pm. We will be sharing some of the activities the children have enjoyed from the previous half term. Please remember it is non-uniform day as well! 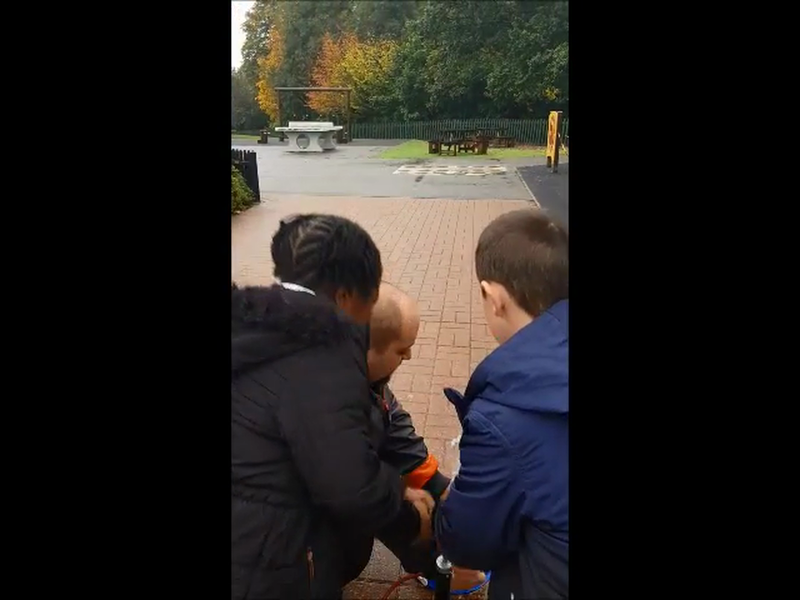 Here is a clip from our Science investigation about water rockets. The children had great fun pumping the water into the rockets and seeing how far they went. We have been using BBC Dance Mat Touch typing to help us become more familiar with where the letters are on the keyboard. This will help us with our word processing and online research. Use the link below for your children to continue using this fun, interactive online teaching tool at home. BBC dance mat typing We have been using this in computing to help us with our typing. This week we have written our own instructions for making a jam sandwich. To check our instructions worked we followed them and made our sandwiches. We used this to edit and improve our instructions. They tasted yummy! In English this week we have been looking at instructions. We had a go at following instructions presented in different ways. We followed oral instructions, written instruction, images and a mix of written and images. We will use this to inform our own instruction writing. e-safety - 21.09.2018 This week in computing we looked at e-saftey. The childre really enjoyed learning about e-safty using this online game from CEOP. It is very important our children keep themselves safe online. Please talk to your child about what they do online. This week in maths fluency we have been looking at our number bonds and 2 times table. We used songs to help us with this. Take a look at them below and sing them at home with your children. We will use a variety of songs and game to help us remember our times tables. We have had a lovely first week back in The Base. Amongst other learning we have been thinking about e-safety. Here is a picture of the class charter we have signed. You might want to revisit it with your children at home. Have a lovely weekend! This week we have been learning about instructions. Yesterday we made some potions to help us to generate some fantastic vocabulary that we can use when we write our spells tomorrow. We all had a lot of fun! This week we have been writing poems about Autumn, using our senses. Today each child performed them in front of the rest of the class. Everyone did a great job of keeping their voices nice and loud and using fantastic actions and expressions. Ask your child to perform their poem for you this weekend. Here is one performance that we all loved. Have a great weekend! We came to the end of our addition and subtraction unit today and answered word problems using different methods we had learnt throughout the unit. Ask your child which method they like to use best when solving addition and subtraction word problems and why. Have a lovely weekend! In Friendship Group today we took it in turns to guess small plastic animals that were hidden in a feely bag. The children could feel and peek at the animals and then had to describe these animals to their friends without saying the name of the animal. They were very good at feeling the animals and describing exactly what they could feel. Everyone managed to guess all the animals. Have a go at practising this with your children using different objects from home. This week in The Base, the children have completed some fantastic learning about inverted commas. Ask your child when you need to use them. We will be writing stories next week as we come to the end of this unit and I am sure I will see lots of inverted commas in their writing. Enjoy the weekend! This week we have been writing our own stories at the end of our English unit. The children used Clicker6 to help them to write their stories and then today they wrote them up thinking about how perfectly we could present our learning. The children in The Base have worked hard this half term to improve their handwriting. Ask your child about their story, can they tell you who their main character was and what they bought? Have a lovely half term and see you all in a week. This week in The Base we have been learning to tell the time on an analogue clock. You can see from the picture above some of the vocabulary we have used. Some of us have been challenging ourselves to tell the time to the nearest 5 minutes. You might like to ask your children the time this weekend to help them to consolidate their learning. Have a lovely weekend! This week we have been learning about units of measure in Maths. Please take the time to point out any units of measurement that you may see this weekend to your children. You can look at the time on an analogue clock together and look at what units of measurement you spot on the sides of any food or drink containers. Happy hunting! We have been learning about fractions in Maths this week, from halves and quarters up to non-unit fractions (2/3, 3/4, 3/8 etc). Next week we will be learning about equivalent fractions and solving fraction problems. Thank you to all those parents who were able to attend the Open Afternoon on Tuesday. It was great to receive your feedback and lovely to see you learning about some of the Base resources from your own children. I hope you found it useful. Have a lovely weekend! We have had an exciting few days trying to solve the mystery of the theft of the round diamond. We wrote crime reports in English yesterday and today we solved Maths problems to collect letters for a clue to who the culprit might be. Once we had solved all the Maths problems we discovered our clue was the word 'female'. So we immediately knew it wasn't Mr. Haig! We found out who it was later in the day so ask your children if they haven't already told you. Please also remember that school is closed tomorrow for an Occasional Day. Enjoy the long weekend! For the last 3 weeks we have been learning about traditional tales and we have focused on Little Red Riding Hood. This week we have written our own versions and the children have used Clicker6 to write some fantastic stories full of descriptive detail. Ask them to tell you about some of the similes and noun phrases they used. Well done everyone for a great few days of writing. Have a lovely weekend!